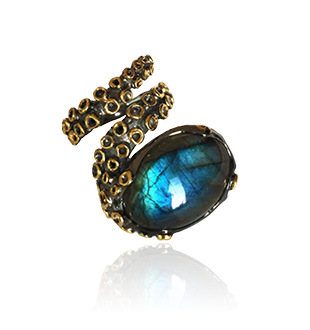 A solid sterling silver statement ring with black rhodium finish and 18k yellow gold accent featuring labradorite. Keiko Uno’s Octopus collection is inspired by the mystery, intelligence and tenacity of one of the ocean’s most revered creatures. From the Gorgon, Kraken to Akkorokamui, the myths surrounding octopuses have gripped our collective imagination for thousands of years. These mysterious creatures fascinate with their unconventional elegance and tenacious ability to adapt, escape and regenerate. Be among the first to be adorned in our dynamic and elegant 2018 Spring release Octopus collection.